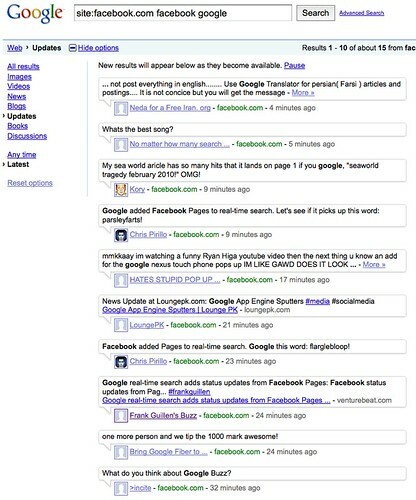 Google’s Real Time Search has gained a new data source, updates from Facebook fan pages. Google had announced a deal to list this information back in December, and now it’s finally being implemented. Google has tweeted the news. All but the last three were part of Google Real Time Search when it launched in December. MySpace material was added this month. So were Google Buzz posts. Our How To Search Google Buzz post provides detailed instructions on how to search on Google Real Time Search for just Buzz or Twitter information. With Facebook, it’s important to note that it is only Facebook fan page updates that are included. Things that are shared on fan pages by fan page owners — such as links, status updates, photos and vidoes — can now be found in Google Real Time Search. However, comments made by non-owners on fan pages will not be included. Nor will updates that are made on personal pages. Our Google & Bing’s Unequal Facebook Status Update Deals article explains more about this. And while Bing is getting more data than Google, as covered in that article, it has yet to make any of it findable. This is also a good time for search marketers and marketers in general to think again about Facebook, if you haven’t already. 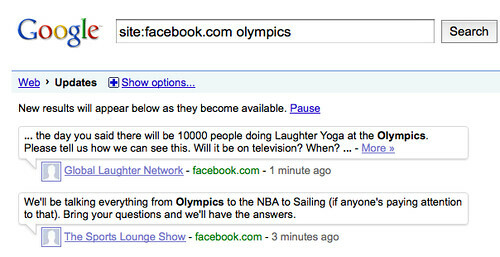 More and more Facebook content has been made visible to search engines over the years. Also in that time, fan pages were added but still aren’t used by some. Google’s move makes having Facebook fan pages even more essential. 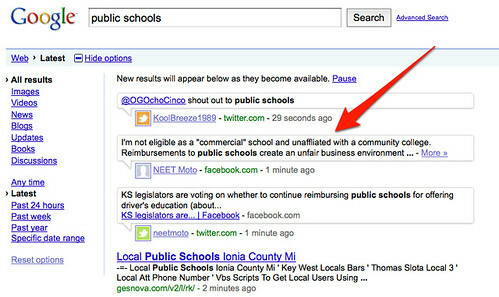 Without one, you’re missing out on a chance to be found within yet another area, Google’s real time results. And hey, speaking of fan pages, a reminder. You can follow Search Engine Land on its own Facebook fan page. I also maintain my own page here. 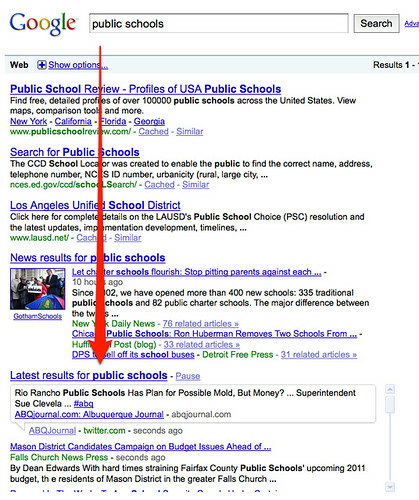 Postscript (4:45pm PT): I’ve been watching Google Real Time Search results closely since the launch. 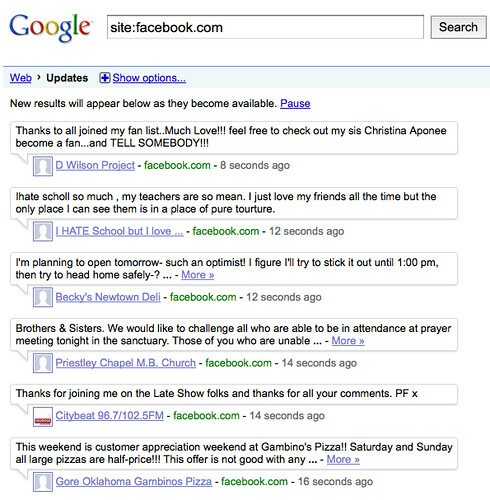 So far, I don’t see any Facebook fan page updates making it into Google’s real time box in its regular results. I’m sure they’ll come, however. They do show when you drill-down into real time results.